Coinciding with All Saints Day on the Christian calendar, here is the second of three "Fanfare" columns which take a look at church-sponsored corps and their place in the history of drum corps in America. JoAnne Parente contributed the following. As a member of the Saints, we used to joke all the time that we were the only corps with a holy day of obligation celebrated for it. We even attempted to choose that date for this year's 40th anniversary reunion. The Saints were sponsored by Our Lady of Peace Church in Fords, N.J. As a matter of fact, even though the restriction was dropped a year later, our original membership rules in 1967 stated that one had to be a parishioner to join. Our original corps colors, blue and gold, were the school's colors as well. Our original shakos (hats) had a cross in the center of the medallion, and the Saints logo is the intersection of a halo and a cross. The parish provided us with full access to the buildings, and we pretty much "owned" the parish center for the 10 years the Saints existed. We took several full corps shots over the years on the church or school steps, and they were always announced as one of our sponsors. The morning of our first parade in April, 1967, we attended mass together in uniform. We also prayed the "Our Father" together before every guard and corps competition. The Saints held their first registration in May, 1967 in the cafeteria of Our Lady of Peace Church in Fords. The only recruiting done at the time was a small piece in the parish bulletin that ran for a couple of weeks. Amazingly, by the time the first rehearsal was held in July, we had enough members for two color guards, the horn line (about 35 members), a drum line (about 15 members), and a twirling squad, (yes, as in batons). While original records are missing, the corps picture taken on the parish school steps from April, 1968 shows 82 members. It was the day of our first parade, and a few members were missing from the picture. The corps continued to grow and excel until it disbanded after the 1977 season. Of the roughly 350 members we had over the years, nearly half were related to at least one member or instructor. I marched with my sister Karen in the color guard. We were both original members. Member relations certainly started because of our parish affiliation, but obviously continued long after that membership rule was dropped. Quite frankly, I think the original corps structure encouraged siblings to join together. Bruno Zuccala contributed the following. 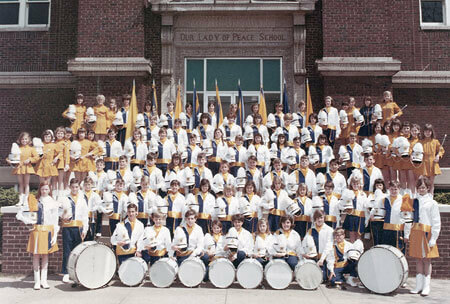 The Catholic Daughters of America All-Girl Drum and Bugle Corps was established in 1936 from the CDofA Court in the Butler Catholic Deanery and lasted until 1978. It was "the thing" for girls to do in the city of Butler, Pa. The entire nucleus came from the Butler Catholic Churches and moms in the Court wanting their daughters to be in a Catholic youth activity that had a musical, athletic, and spiritual environment. The "kelly green and white" entertained audiences through drum corps performances as well as church dedications, local parades and inaugurations of Pennsylvania governors. These girls had such a special relationship because of the strong ethnic and religious background established within their homes. The girls had a very close relationship with each other. They went to school and church together and marched together. Locally, they recruited excellent instruction. One could hear their music every week as they practiced at the local athletic field. The generations of girls knew the routine of every Tuesday night rehearsals and weekend shows. They traveled throughout Pennsylvania as well as the Tri-State area. They were the first corps from the area to venture to the Midwest over the Fourth of July holiday to shows in Deerfield, Streator and Des Plaines, Ill. In 1968, they won the U.S. Open Class A and All-Girl titles simultaneously. The city at the time welcomed the corps down Main Street and they became Butler's Traveling Ambassadors. These girls had such a special relationship because of the strong ethnic and religious background established within their homes. Generations looked forward to wearing the "green and white" and being a part of this classy organization. Jimmy Hickey contributed the following. The Catholic churches and the Catholic Youth Organization (CYO) encompassed a number of activities; including basketball, band, color guard and drum corps. As touring costs became more than the churches could handle, the drum corps activity often was dropped. This happened rather swiftly, and by 1975, most of the church sponsored corps were gone. When I joined the I.C. Reveries in 1967, it was almost exclusively parish kids who made up the corps. In 1971, CYO and church-sponsored corps were still going strong. Father Gallagher was our spiritual advisor. He dropped in on the occasional rehearsal and met regularly with management. As far as I know, there was no rule stating that members had to be Immaculate Conception parishioners. We were never forced, or even encouraged to attend mass, and we usually did a parade for the church for those celebrating their first communion. By 1970, we had picked up members from the Everett Statesmen, the Jeannettes, and a couple of other small local corps. At this time, the I.C. Reveries competed in the Eastern Massachusetts Circuit and CYO. In the early 1970s, Revere (population 40,000) had the Reveries and Reveries Winter Guard, St. Anthony's Band and Winter Guard (later the WGI champion Quasar) and the 27th Lancers, all in active competition. CYO finals in those days took place over two days; there were so many units they couldn't possibly have let them all perform in one day! What led to the downfall of the parish based corps? In the case of the Reveries, it was dwindling membership, money, and the fact that we shared the town with the 27th Lancers. Many Reverie members had older siblings who marched in the 27th Lancers. By that time, many of the church based corps had either folded or were struggling. In order to be competitive, corps really needed to tour, and churches usually could not afford to fund a tour. A few corps hung in there until the late 1970s, but by the time the 1980s rolled around, the existence of parish-based corps was almost extinct. All that remains today are a few WGI color guards. I envy today's corps in some ways with their sophisticated shows, professional management, and dazzling, complex shows. However, it was also an incredible experience to take the field with your neighbors and childhood friends and show the world what you could do. Read part I.